Snaggletooth Primitive RV Camp is just a spot along a “dark desert highway” that might otherwise not notice. 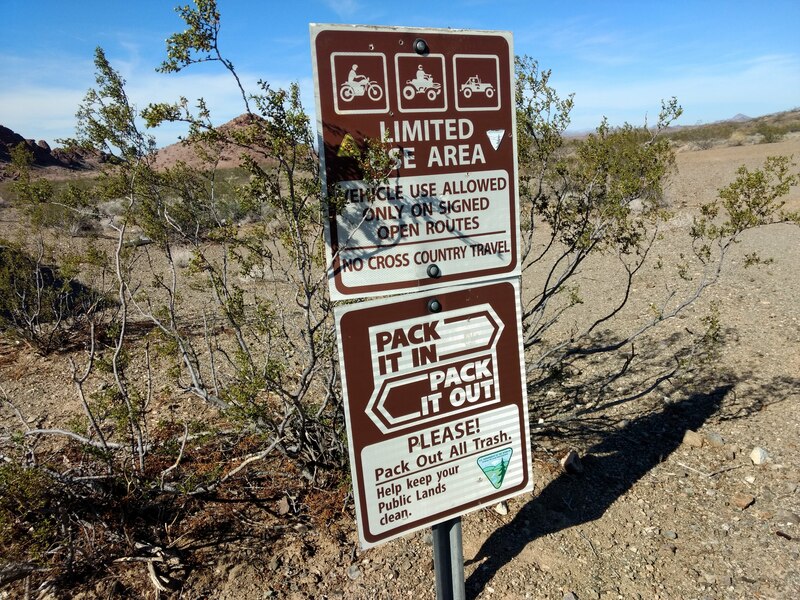 Located along US-95, on the west side of the road, just west of the Chemehuevi Mountains Wilderness Area, right by an outcropping of reddish sandstone hills and boulders. 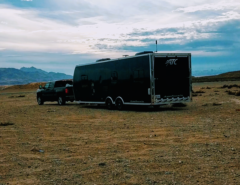 Sash and I arrived there for the night, Monday, November 12, 2018, using it as a layover along our drive from Joshua Tree National Park to Lake Mead National Recreation Area. Snaggletooth is thus named because of the jagged, tooth-like rocks and boulders lining the ridges of the reddish-hued hills that mark this campsite. It’s actually part of the larger “Heart of the Mojave” desert region, and is managed by the Needles Field Office of the Bureau of Land Management. There are two primary parts to Snaggletooth. 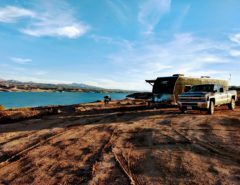 The first is a large, flat gravel parking area right off the highway, large enough to accommodate RVs, buses, and semi-trucks. 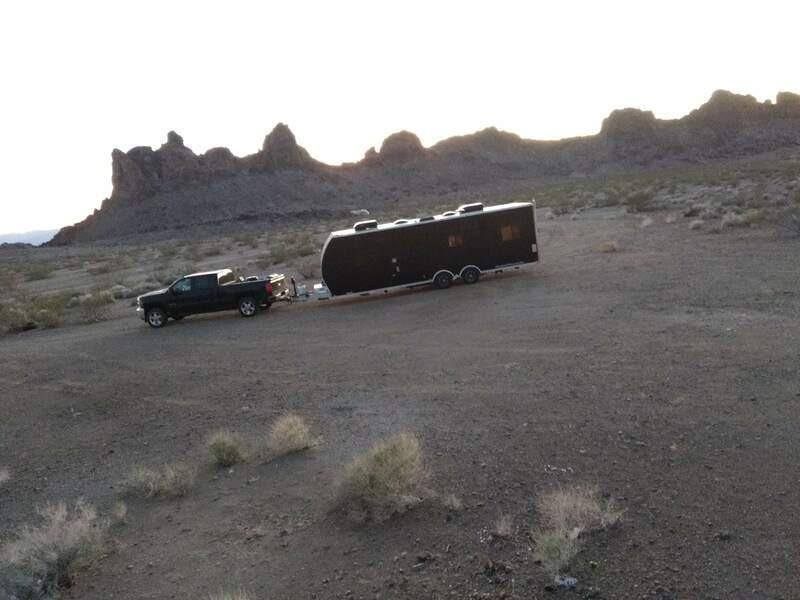 The other part is a gravel road leading through the Snaggletooth Hills taking you past numerous campsites, some large enough for several rigs. The road actually takes a turn north and runs for a few miles until it loops back into US-95. 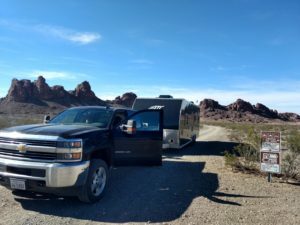 When Sash and I got there, we found only one other RVer who had driven down the gravel road and found a campsite tucked away behind a ridge. We decided to set up just beyond the large gravel parking lot, maybe only 30 feet down the gravel road. That large gravel parking lot is actually quite littered with trash. 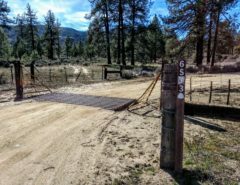 But as you drive down the gravel road, you find plenty of pristine campsites with only evidence of campfires to be seen. The next morning, we walked further down the gravel road, and realized what a great place Snaggletooth is for a longer stay. Verizon 4G came in strong enough for all of our needs, while the backdrop of the Snaggletooth Hills created a beautiful sight to set up camp. The only downside is that it’s about 20 miles into Needles for supplies and amenities. But that being said, Sash and I have camped in more remote areas. But we found some decent hiking throughout here, along with more hiking on the other side of US-95. 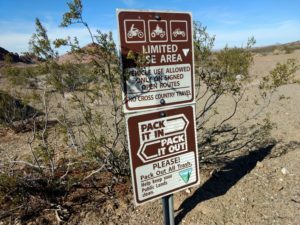 It’s seems to be a great place for hikers who want to spend more time in the Mojave desert exploring hills and mountains. There are no signs posted on the maximum length of stay, so we assume the usual 14 day limit applies.